This may be a controversial post because icicles hanging from gutters isn’t a good thing, right? If you’re a homeowner who recently installed gutter guards and woke up to see icicles hanging from your gutters, you’re probably wondering what the heck is going on, especially if this is the first time it has happened. I have heard from countless homeowners over the years who are upset because their new gutter guard system — a system they purchased during the warmer months — has allowed icicles to form and is no longer working properly. 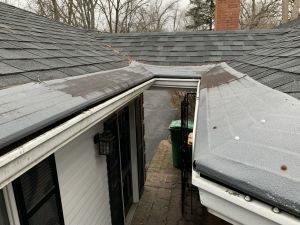 I have read blog comments and product reviews where homeowners declare their gutter guards useless because icicles are now forming on the edge of their gutters where icicles had not previously appeared. 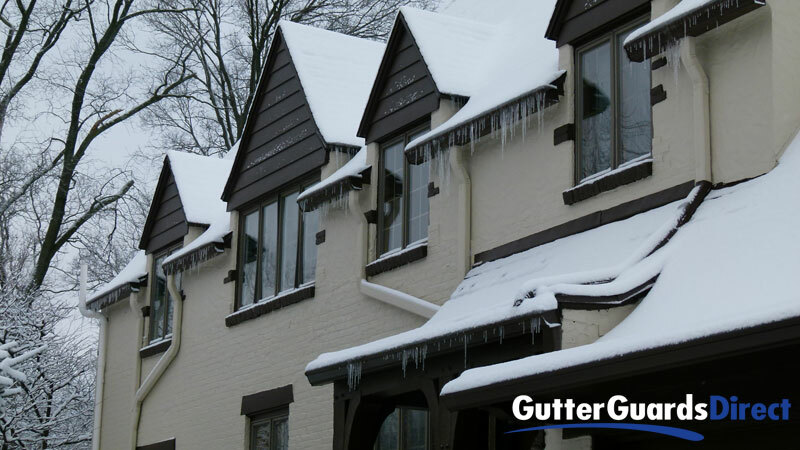 Even after spending hundreds or thousands of dollars on gutter guards, these homeowners are convinced that the only option is to remove their newly installed gutter guards in order to get rid of icicles. Leaf Solution Gutter Guards on a home the morning after 3″ of snow fell. Note icicles hanging off most but not all of the gutters. If you’re one of those homeowners, I’m here to tell you that icicles forming from your gutter guards is GOOD not bad! The reality is that given enough snow and ice accumulation in your gutters, icicles will form without gutter guards installed, but the formation of icicles on homes with gutter guards will actually be more likely to occur. That’s right, it’s virtually 100% GUARANTEED that if frozen rain or snow is falling from the sky and you have gutter guards installed, icicles WILL form on your gutters! There are some legitimate reasons why having icicles hanging from your gutter guards is a nuisance — like water dripping onto the ground in front of an entry door or along a walkway — but there are also reasons why it is healthy for your gutters and your home. 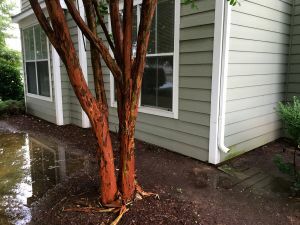 Take a step back and assume you don’t have gutter guards, and your gutters are clean so water can successfully navigate through the gutters into the downspouts and away from your home. Once rain water freezes, water will no longer flow through your gutters, and layers of ice form. The thickness of the ice is in direct correlation to the amount of freezing rain that falls. Once the freezing rains turns into snow, it will quickly accumulate inside your gutters and fill the gutter cavity. Depending on the amount of snow fall and temperatures during the subsequent days, there will be a certain amount of thawing and refreezing. In other words, some snow will melt and flow out the gutters while the remaining snow will refreeze and turn into ice. If you have no more snow accumulation during the next few days and temperatures rise above 32 degrees fahrenheit, odds are that the ice will melt and your gutters will return to normal operation. However, if you continue to experience sub-zero temps and snow mounts, the amount of snow and ice inside the gutters will expand until it overflows the gutters. Once the build-up of snow and ice in your gutters reaches the top edge of the gutters, most thawing will occur on the surface, which means that water will drip from the front and back of your gutters by day and will form into icicles at night when temperatures drop. 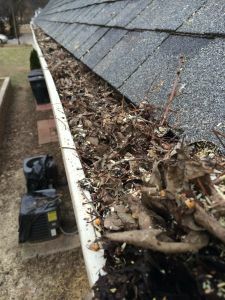 Gutters will continue to be overwhelmed by melting snow from the roof, which will cause a thicker layer of ice to form above the gutter edge, and icicles will grow in size. This is the point at which ice damming becomes an issue because if the ice that forms inside your gutters backs up underneath the shingles, it is more likely to penetrate the roof decking, enter your home’s interior, and cause ceiling and wall damage. The following video by MetLife Insurance illustrates what homeowners can do to combat ice dams. Water follows the path of least resistance, so the salt-filled sock will melt the snow and ice, creating a channel for the water to flow to the bottom of the sock where it will drip to the ground. The “salt sock” moves water from the roof and gutters to the ground in much the same way as icicles and has been proven to be a safe and effective method to get rid of ice dams. So what does that mean for gutters that are covered with gutter guards? 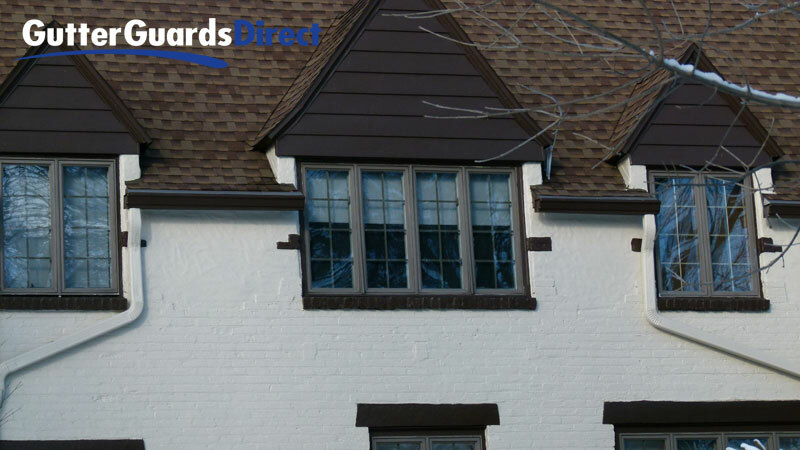 Gutter guards cover the opening of your gutter. Whether your gutter covers are solid, perforated aluminum or screen, they will prevent most snow and ice from entering your gutters. Since snow and ice forms on top of the gutter guard surface instead of inside the gutters, you are more likely to see icicles form right before your eyes, and this worries folks. This is the same home, pictured the next day. The snow and icicles have melted off the roof and gutter guards despite the 20 degree temperature. However, because most ice and snow cannot enter your gutters, it will melt and dissipate more quickly. As the sun shines onto your roof, it will melt the snow and ice on the surface level first, which means the icicles will disappear and the gutters will be free flowing immediately rather than after days or weeks of thawing and refreezing. What’s more, your gutters will not be burdened by the huge weight load of ice and snow inside the gutters, so they will stay firmly attached to your home and will continue to provide years of reliable service. You still might not like the sight of icicles but, given a little time, they will melt along with the snow and spring will be here before you know it! Question: Agree or disagree with this post? We’d love to hear your comments and experiences about how you have dealt with icicles forming on your gutters. Please leave your comments below. Join our E-mail List: If this article was helpful, sign-up for our e-mail list at the top of this page to receive notifications of future stories, product offerings and special discounts. Plus, select any photo in the article to share this article on Twitter, Facebook and Pinterest! These is good information on gutter guards and it will help many people when they are looking for gutter guards. I have a gutter guard system on my house. This is the first winter, and we have a TON of icicles. Apparently this is a known issue that gutter system companies hide in the fine print of their contracts. Which seems extremely deceptive. I think it looks awful, is dangerous, detracts away from curb appeal, and decreases property value because it appears that I don’t insulate my house. Weather Tight is the company that did ours and I would like to warn all prospective gutter system buyers about this issue.